It is difficult to know where the animals are in the forest. That is why, the biologists arrange secret cameras in the forests. These cameras are arranged in the bushes and trees branches and take the photos and videos when any animal passes that way. By arranging this kind of secret cameras in the Indonesia forests, existence of two animals was known to the world. These two animals are very rare animals. One is leopard and the other is Rhinoceros. Do you the animal which is in danger among all the animals which live on earth…? It is this rhinoceros. Total number of these rhinoceros does not exceed 40 on the earth. 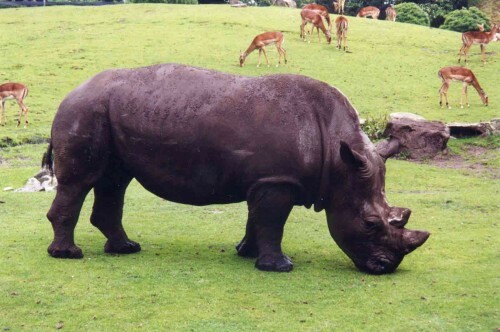 The name of this rhinoceros is Javan Rhino. These Rhinos which are often seen in Asia and in other countries are 10 feet long and grows to a height of around five to six feet. These weigh around 2300 kilos. Among all the Rhinoceros species, Javan rhino is the shortest one. In some countries, the horns of these rhinos are used in medicines. In the black market the value of these horns will be around one lakh per kilo. That is why this is in the danger of extinction now. The qualities of Javan rhino are very different. It spends most of the time being alone. It creates a border for the area it moves by spraying urine and with dung piles. Interestingly, this rhino twists the bushes and plants in order to prevent other animals from entering into its territory. fruits and leaves are its food. The rhino is ready to face any danger. Javan Rhino lives for around 30 to 45 years of age. Clouded leopard which was not seen by anybody is now caught by the camera. The name of this leopard is Clouded Leopard. It got that name because it is having an irregular cloud like spots on its body. These can live even at seven thousand feet high from the sea level. Though clouded leopards are ten times small when compared to tigers their teeth are in similar size of the tiger’s teeth. The tail is also very big which around three feet long is. With the help of that tail and nails the leopard climbs the trees very swiftly. Besides this the leopard also knows how to get down the trees upside down. The weight of the leopard will be in between 15 to 24 kilos. As the number of these leopards is very less, they have joined in the list of the animals that are endangered. « Why Is The Circle Divided Into 360 Degrees Specifically? » Do Comets have Water in Them?